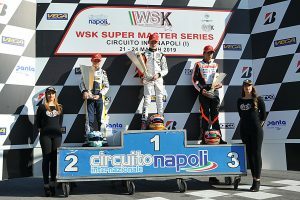 Duels ending at the final lap and drivers hunting for the win in the weekend that just ended in Sarno (SA) added to the battles for the final classifications of WSK Super Master Series, that reached its fourth and closing round of the season. The International Circuit Napoli in Sarno has housed today the closing day of the event with two Prefinals and one Final for each of the entitled categories. These races contributed to defining the final classifications in the four categories. 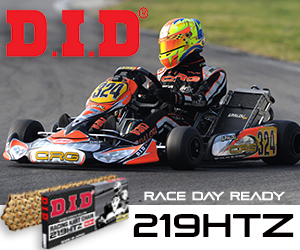 A troubled start in qualifying on Friday made the Dutch Bas Lammers (Sodi Kart-TM-Bridgestone) even more focused than usual and he bounced back step by step winning Prefinal B, the Final and taking the KZ2 title. 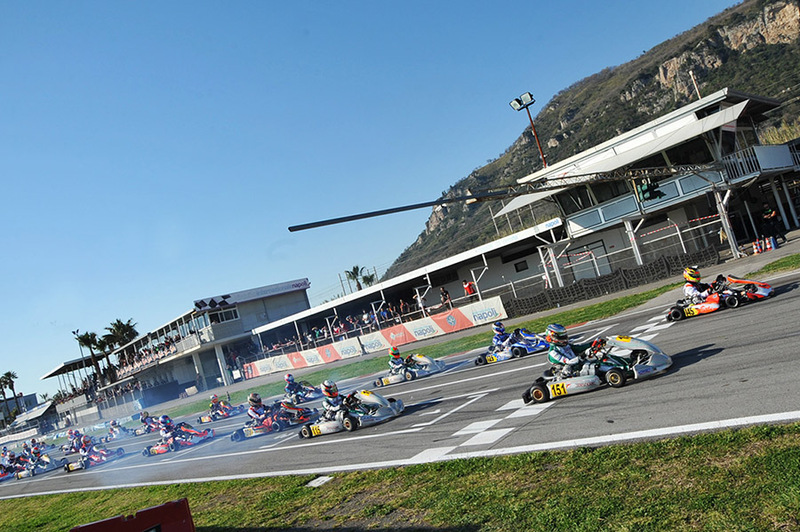 The toughest rival of the Dutch in the Final (above, the start of the race) was the Italian Marco Ardigò (Tony Kart-Vortex) who started on pole after winning Prefinal A. He got off to a good start and kept the lead but had to concede the first position to the Dutch driver a few laps afterward. Ardigò closed the race in second position proceeding teammate Matteo Viganò. Dexter Patterson (KR-Iame-Bridgestone) ended a perfect weekend run as the leader. He collected all the available points and confirmed the classification lead he built in the previous races. On top after qualifying, the Scot won today Prefinal A and got the lead of the Final pulling away from his nearest rival, the Brit Taylor Barnard (KR-Iame). Patterson secured, therefore, the victory of the race and that of the final classification. Barnard, won Prefinal B and could not do anything more than taking a well deserved second place leading the Brazilian Gabriel Bortoleto (CRG-Iame), who also had a positive weekend. The Russian Artem Severiukhin (Tony Kart-Vortex-Vega) set the pace in OKJ winning Prefinal B and the Final. The Dutch Laurens van Hoepen (FA-Vortex) won Prefinal A, but ended the Final in second place, inheriting the place of Jamie Day (Exprit-Vortex), who was handed a time penalty. 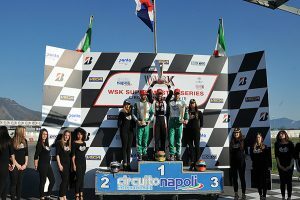 The latter lost P2 due to the misplaced front fairing and lost the victory of the final classification too, while the swedish William Silverholm (Tony Kart-Vortex) jumped in third place.The Italian Andrea Antonelli (KR-Iame) managed, therefore, to retain the classification lead. A spectacular Final of 60 Mini with a lot of drivers battling the victory out was expected and this is what happened. The race and the title went to Rashid Al Dhaheri. The driver from the United Arab Emirates after conceding Prefinal A’s win to Joel Bergstrom, got the lead of the Final winning the race, while the Swede was stuck after a troubled start. 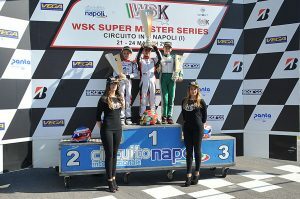 The 2nd place went to the Pole Maciej Gladsz (all on Parolin-TM), who won Prefinal B, while the Italian Andrea Filaferro (TonyKart-TM) was third.